Record all the milestones from your little one’s first year in this elegant baby book. 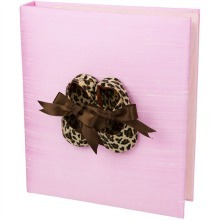 Its ice pink silk cover features adorably chic Leopard print shoes accented by a chocolate brown satin bows. Inside the binder style book are 50 fill-in memory pages to note gifts, doctor’s visits and memorable moments. Personalize this book by adding a monogram to the bottom right corner in chocolate thread. A perfect gift for new parents, this fashion-forward baby book will be cherished for years to come. Photo and archival safe. Enter initials exactly as you with them to appear. Traditionally, the last name is the center initial of a monogram.